GolfMania FedExCup Edition is a fundraising hole-in-one! Sweepstakes participants have a 1 in 20 chance to win a prize – all based on the performance of 5 randomly assigned golfers from each of the 4 FedExCup Playoff tournaments, played during late August and September. Ticket status: Available – get your tickets and begin selling them now! 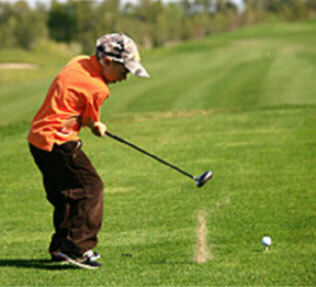 GolfMania is an exciting sweepstakes fundraiser based on professional golf’s 4 FedExCup Playoffs tournaments. 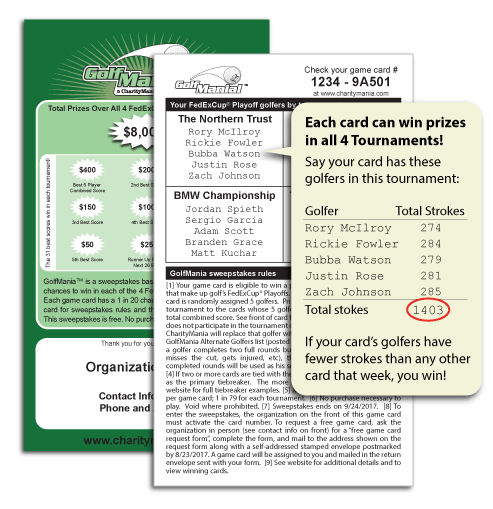 All sweepstakes game cards have an equal chance to win prize money based on the performance of the random golfers printed on the back. Game cards contain 5 random golfers in each of golf’s 4 FedExCup Playoffs tournaments (you get 5 new golfers for each tournament). To play the game, participants simply add up the total strokes by their 5 golfers. Prizes are awarded at the end of each tournament to the game cards whose 5 golfers have the best total combined scores. If your golfers don’t do so well, we also offer prizes for the cards with the worst total combined scores! There are 2,688 unique game cards, each of which has a minimum 1 in 20 chance to win a prize during the year. How the prize money works Sweepstakes participants can win $1,000s in cash prizes based on the performance of 5 randomly assigned golfers from each of professional golf’s 4 FedExCup Playoffs tournaments. CharityMania calculates the winning game cards after each tournament. We then send you the prize money so that you can send it to the winners with a personalized letter thanking them for their support. What Do Our Customers Say About Our Fundraisers? GolfMania FedExCup Edition begins on August 23, 2018. Make sure you order your tickets early enough to distribute and sell them before the sweepstakes begins.